Existing businesses are facing disruption at all levels. Younger employees are not satisfied with just a “job,” but rather, want work that allows them to be involved and included in decisions. Traditional command and control leadership models are floundering, unable to adapt to the need for more collaboration and inclusion. Flattening organizational structure is all the rage these days, but until we move beyond some of our long-cherished myths about what it means to be a leader, it will be difficult to generate change truly. Here are seven of the most common myths about leadership that keeps us stuck. Our current view of leadership tends to be one-dimensional, with responsibility for leadership belonging to one or two people at the top of a pyramid of power and control. In reality, leadership is multidimensional. In any given day, each of us moves through a range of different expressions of leadership. We are all leaders in one way or another, and when we hold a wider view of leadership, we can work together in a way that utilizes the unique talents of everyone. "They're a born leader.” We hear that all the time. But what does that really mean? We are all capable of becoming powerful leaders by taking full responsibility for however we might contribute to any endeavor, whether our contribution comes from in front or from behind. A title does not make someone a leader. We have plenty of examples of people with fancy titles who are not able to connect, inspire, empower and develop others. It is the “lone wolf” theory of leadership. Keep yourself isolated and separate from “the pack.” Otherwise, you will be unable to retain the alpha position and lead effectively. It might have been a useful notion when the strongest did survive because we had to hunt for food or run from predators, but we have far outgrown this basic biological functioning. Effective leaders of today are skillful at evoking leadership in others. In today’s inclusive work environments, coaching is considered a core competency of great leadership. In the past, we tended to characterize leaders as heroic, bright problem solvers who provide solutions to difficult problems in an instant. It is the antithesis of collaboration and inclusion and produces solutions that are often shallow or one-dimensional because they have not undergone rigorous, committed examination and debate. Curiosity and powerful questions are a critical part of effective leadership. As the pace of modern day life has quickened, we have become increasingly action-oriented and results driven. It seems expedient to just dispense with all the “soft” stuff and drive hard for outcomes. Unfortunately, when we are disconnected from the beings of ourselves and others, this incessant doing leads to actions that are not grounded and leaves us feeling disconnected and desperate for meaning and belonging. Leadership that is nourishing and balances being and doing is called Co-Active Leadership — with the co- (being) and the -active, (doing) working together harmoniously. Everything in our natural world teaches us that these two energies of co- and active- weave together in every moment. Like the yin and the yang of ancient Chinese Taoist philosophy, co- and active- work together to generate connection, balance, and wholeness. We tend to believe that once leadership has been assigned by role or title, things stay that way until the designated leader resigns, is fired, or dies. In reality, leadership is the most effective, dynamic and alive when it moves rapidly throughout the system. 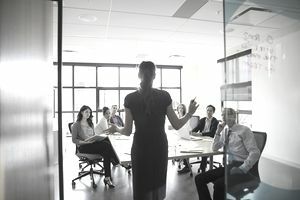 In this way, everyone is a leader — sometimes leading in front and pointing the way, sometimes leading from behind and supporting the initiative, sometimes leading from beside in partnership and sometimes leading from the energetic field, using instinct and intuition to sense into what is not being spoken. It is such a deadly myth. Failure is an essential part of exploration, new discovery, and encouraging innovation. If we cannot afford to fail, then we must stay with proven approaches from the past. Our actions lack curiosity and exploration because we are so afraid of failure that we aren’t willing to try something new. It is only by failing repeatedly that we can learn, evolve and grow. It is important for leaders to embrace and celebrate failure as an important aspect of development and discovery. Consider this new simple definition of leadership: Leaders are those who are responsible for their world. When we have the capacity to respond creatively rather than in a patterned and reactive way, when we understand that we are the authors of our own lives, we are, in fact, leaders. This definition of leadership allows people to contribute from their individual strengths and generates leadership that is dynamic and inclusive. We are all valuable, and we each hold a piece of the solution to the challenges that face us. It is only when we release these outdated myths about what leadership means and seek new definitions that we will be able to work and live together in a world that utilizes the best of everyone. Karen Kimsey-House is a co-founder of CTI, an in-person coaching and leadership development company. She continues to lead CTI workshops and is a dynamic keynote speaker. She is also the co-author of Co-Active Coaching.